Jewelry designer, vlogger, singer, voice actress and all around goofy gal. 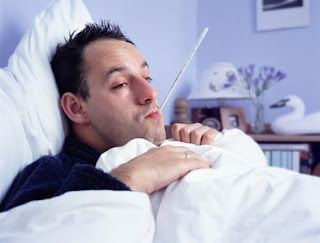 The flu has arrived and I was not lucky enough to evade it. Are you? Here are some tips to help you avoid it or at least get over it faster. Of course the most obvious choice to avoid it all-together would be to get the flu shot, but if you're allergic to eggs like me, here are some other options. Wash your hands, wash your hands, wash your hands! Kissing someone is less likely to get you sick than shaking their hand. Now think of how many hands you shake in a week. Or how many subway rails you touch. Eeew. Stop touching your face. Don't scratch your nose, use a tissue. Don't rub your eyes, use eye drops. Don't touch your lips, kiss someone instead! Get lots of sleep. Instead of hitting up happy hour, then staying out until witching hour, just catch one drink at happy hour then go home and cuddle up with your pup for an early and cuddly night. Now, to get over this crap faster, if you were unfortunate enough not to avoid it. If you have access to it, take a Tamiflu immediately! If you don't have it, try to get some to save for next year. So, you know you've got the flu, or at least you know you feel like sh*t. Call in sick to work! Don't go in there feeling misserable and getting everyone else sick, unless you work with a bunch of truly horrible people and you just want to get even for all the mean things they've done. In that case, you should try your hardest to not appear sick, that way they'll get close to you without hesitation. But you probably shouldn't do that. It's mean. Lay in bed and enjoy this horrible ride. I seriously hope you have a roommate, boy/girfriend, best friend or someone who cares enough about you to run to the store and get you a ton of stuff to help you feel better. Like expectorant, a humidifier, sugar free throat drops, tissues (tons), pain killers, tea, vitamins, a thermometer, chicken soup and a box set of that series that you never got to watch but always wanted to. Good luck! I hope you get over it faster than I did, which was, oh wait, not yet. It's been a week, hopefully it'll be gone soon. LOL, it does, doesn't it!?! Thanks for visiting my blog. I'd love it if you'd follow me and let me know what you think of my meanderings. Recent reviews by Ryan R.